There is a level of (let's call it) discomfort among investors and business people everywhere I go in the world now. It is becoming increasingly palpable with each passing month. The overriding sentiment seems to be, "That which cannot be sustained will not be." We live in a world that is premised on economic structures that are now unsustainable, and that is a word we are going to hear used more and more this year. Unsustainable. It will be a theme in my writing, not only in my annual forecast issue, which will be out in a few days, but throughout the year. But just because things are unsustainable does not mean the end of the world for you and me. It is just that our world will change. Our job is to make sure that we manage the transition. Transition. That is another word we are going to see a lot this year and next. I am going to invest a great deal of my intellectual capital (meager as it is) in thinking about how we transition our lives (not just our investments!) through the Endgame of the biggest bubble in the history of the world, that of government debt and promises. That bubble is going to collapse, in one way or another. Our job is to make sure we are not in the vicinity of ground zero. Meanwhile, there are a lot of positive things happening that we do not want to miss while our governments are busy rearranging deck chairs and kicking cans. In today's Outside the Box, the first of 2013, we’ll look at the opening pages of an important paper written by Daniel Stelter of the Boston Consulting Group. I have his permission to send it on to you. At the end of the letter is a link to my site, where you can read the rest of the piece (his suggestions for government action) if you are interested. If you are not registered on Mauldin Economics, just put in your email address and then you’ll have immediate access. Warning: there are sections of Daniel’s article that are not politically correct! I can guarantee you that you will not agree with all of his ten suggestions. Some will raise your blood pressure. But I suggest you read from the point of view of understanding just how difficult it will be to resolve the problems our governments have created. No one knows how long the developed world’s Ponzi scheme can go on without causing major social and economic breakdowns. As long as it does, however, economic uncertainty will remain high. One indicator of growing uncertainty is an index developed by economists Scott Baker and Nicholas Bloom, of Stanford University, and Steven Davis, of the University of Chicago. 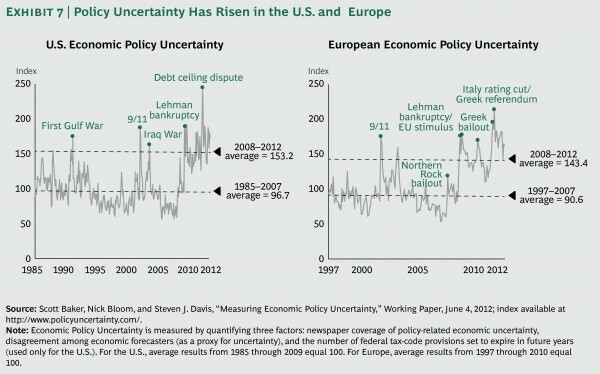 Their “economic policy uncertainty index” shows not only that overall levels of uncertainty have risen since the financial crisis, but also that this uncertainty is increasingly driven by political disputes over economic issues rather than by events such as 9/11, for example, or military conflicts such as the First Gulf War. To the degree that politicians and other leaders fail to address the structural challenges described in this paper, the odds of economic paralysis go up. The underlying issues cannot be ignored any longer. The developed world faces a day of reckoning. It is time to act. I will be with Dan in London in 10 days, along with my Endgame co-author, Jonathan Tepper, as well as Simon Hunt, Dylan Grice, and Anatole Kaletsky, among other notables. It will be an interesting discussion. I am sitting in a rather idyllic setting as I think about unsustainability and transition. I am at Jon Sundt's Hollister Ranch home in the mountains overlooking the Channel Islands and the Pacific. It is remarkably beautiful and serene. I am glad he pays California taxes so I can come and enjoy this piece of heaven a few times a year. Jon is a world-class surfer (even at 50), and the surf the last few days has been huge. The best surf in California is arguably right down at the foot of the mountain here. But as with our global transition, to get from the top of the mountain, where all is calm and serene, down to the exciting edge between order and chaos where the surf rolls in, involves trekking over some narrow, twisty roads and rough terrain. If you have the right vehicle and know what you’re doing, it’s no problem. But you have to be careful on the hairpin turns, to make sure not only that you stay on the road but also that there is not someone coming the other way. Local knowledge is critical for a safe transition from the mountain to the beach. A rather fitting analogy for what we face in our lives. I have been having serious hardware issues with my nearly new Hewlett-Packard laptop for the last few days, and it has again broken on me. I have a less-than-optimal workaround, but that might mean that this weekend's letter will be a day late, as I may have to finish it in Copenhagen, since I won't get new hardware till Sunday. We'll see. Let me wish you a very Happy New Year. I will do what I can to help us all think through the issues we face, and I will even try to suggest a few solutions. Now, let's see what Dan has for us and mull over the Ponzi scheme that is government. In 1920, an Italian immigrant to the U.S. by the name of Charles Ponzi created the scheme that would cause his name to live on in history. He announced an arbitrage business that would buy postal reply coupons in Italy and exchange them for stamps in the U.S., taking advantage of significant price differences due to high postwar inflation. He attracted investors by promising extraordinarily high returns—50 percent within 45 days. But instead of investing the money to buy the coupons and exchange them for stamps, he simply used the money of later investors to pay high returns to earlier investors, extracting huge profits along the way. By the time the fraud collapsed, investors had lost nearly $20 million, the equivalent of about $225 million in 2011 dollars. Such frauds have been known as Ponzi schemes ever since. The second-biggest Ponzi scheme in recent history—organized by the New York hedge-fund manager Bernard Madoff—led to losses of approximately $20 billion in 2008. The biggest, however, is still ongoing: the Ponzi scheme of the developed economies. It is not simply that the developed world has borrowed significantly from future wealth to fund today’s consumption, leading to huge burdens for the next generation. It has also reduced the potential for future economic growth, making it more difficult for the next generation to deal with this legacy. It may seem harsh or exaggerated to liken the current troubles of the developed economies to a Ponzi scheme. I do so deliberately to emphasize the scope and seriousness of the problem. Nearly five years after the financial crisis, the leaders of the developed world are far too complacent. Politicians and central bankers have continued to “kick the can down the road,” pursuing policies designed to postpone the day of reckoning and avoid telling the public the truth: that a sizable part of the debt will not be paid back in an orderly way. Fortunately, there is still time to act. But leaders from all social sectors—government, business, organized labor, environmental and other stakeholder groups—need to act decisively and quickly in order to secure future economic prosperity, social cohesion, and political stability. It is in the nature of Ponzi schemes to collapse suddenly, without warning. No one knows what event may send the developed world and the global economy as a whole back into crisis. This paper explores the causes and characteristics of the developed world’s Ponzi scheme and proposes ten steps that every developed economy will have to take to resolve it. All stakeholders will have to make sacrifices. Creditors will have to accept losses. The wealthy will have to pay more taxes. Wage earners will have to work longer and save more for their retirement. Public spending on social welfare will have to be cut, even as spending in new areas of social investment will have to be increased. Government will have to get smaller and more efficient. And because these problems don’t affect the developed economies alone but also global growth, the emerging economies will have to contribute to the solution by consuming more and exporting less. Who pays and who benefits will be subjects of intense political controversy. How critical tradeoffs are managed will vary from country to country. But rather than address these issues, this publication simply aims to highlight the painful dilemmas that the developed world faces, to define the necessary steps toward a genuine solution, and to create a sense of urgency for rapid action. The developed world’s Ponzi scheme is caused by record-high levels of public and private debt. And it is exacerbated by huge unfunded liabilities that will be impossible to pay off owing to long-term changes in developed-world demographics. Record Levels of Private and Public Debt. Since the Second World War, debt levels in the developed economies have continually risen, with a notable increase since 1980. According to a study by the Bank for International Settlements (BIS), the combined debt of governments, private households, and nonfinancial companies in the 18 core countries of the OECD rose from 160 percent of GDP in 1980 to 321 percent in 2010. In real terms, after inflation is taken into account, governments have more than four times, private households more than six times, and nonfinancial companies more than three times the debt they had in 1980. There is, of course, nothing wrong with taking on debt, as long as that debt is invested to create additional economic growth. In recent decades, however, the vast majority of debt has not been used to increase future income but to consume, to speculate in stocks and real estate, and to pay the interest on previous debt. One indication of this trend: during the 1960s, each additional dollar of new credit in the U.S. led to 59 cents in new GDP; by the first decade of the new century, that same dollar of credit was producing just 18 cents in new GDP. Hedge financing, in which the debtor has sufficient cash flow to pay interest and to pay back the principal. Speculative financing, in which the debtor can service the loan—that is, he or she can pay the loan interest that is due but not repay the principal out of income cash flows. Therefore, the debtor needs to continuously roll over liabilities by contracting new debt in order to meet the obligations on maturing debt. Ponzi financing, in which the debtor doesn’t have enough cash flow to cover either the principal or the interest. While hoping that the asset will rise faster in value than the total financing cost, he or she must borrow even more to meet the interest payments. The ultimate goal is to be “bailed out” by selling the asset to the next buyer. Today the developed world looks for a “next buyer” to take over its excessive debt load. Unfortunately, there is no such buyer in sight. The Ponzi scheme will have to be unwound. How much money are we talking about? The amounts are extraordinary. The threshold for sustainable government debt is a debt-to-GDP ratio of roughly 60 percent. Applying that threshold to nonfinancial corporate debt and private-household debt as well gives an overall “sustainable debt-to-GDP ratio” of 180 percent. Currently, the amount of debt above that level is approximately $11 trillion for the U.S. and €7.4 trillion for the Eurozone. Although it is nearly five years since the onset of the financial crisis, we are still just beginning to unwind these massive sums. 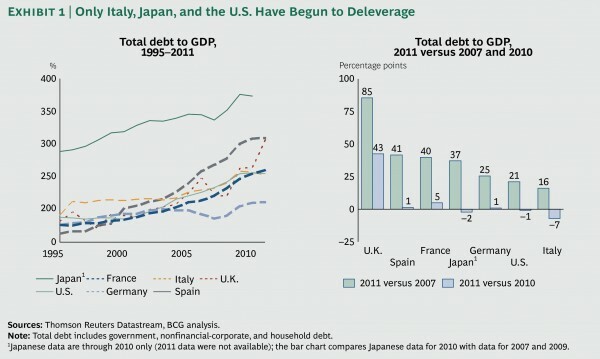 So far, only Italy, Japan, and the U.S. have started to deleverage. (See Exhibit 1.) In the case of the U.S., this deleveraging of the private sector is mainly the result of defaults, not of actually paying back loans. Other highly indebted economies such as the U.K., Spain, and France are still piling up additional debt. Unfunded Liabilities. As bad as the excessive debt burden is, however, it is only part of the problem. The developed world’s Ponzi scheme is greatly exacerbated by the hidden liabilities of governments and companies, especially when it comes to age- or health-care-related spending. The basic approach to paying for such costs has not changed much since the invention of social insurance by Germany’s Chancellor Bismarck in 1889: the younger generation pays for the older generation. Bismarck lived until 83, but such longevity was the exception at the time. The average life expectancy then was 37 years for men and 40 years for women, while insurance was paid only from the age of 70 onwards. Thus, relatively few workers could expect to enjoy payments from public insurance. Over the past century, however, life expectancy has doubled and fertility rates have declined by more than half in the developed world. In 1880, the median fertility rate among women in today’s G-7 countries of Canada, France, Germany, Italy, Japan, the U.K., and the U.S. was 4.6; today, it is at or below the rate of natural reproduction of 2.1, with rates in Germany, Italy, and Japan as low as 1.4. At the same time, the retirement age has been lowered significantly—so much so that the number of retirees supported by the working population has grown precipitously. In Germany, the old-age dependency ratio (that is, the number of persons age 65 or above per 100 persons of working age) was 14 percent in 1950; it is 31 percent today. And it will increase to 57 percent by 2050. In other words, every retiree will need to be supported by fewer than two fully employed people. In Japan, the dependency ratio was only 8 percent in 1950; it is 35 percent today and will climb to 70 percent by 2050. By the end of this century, there will be at least a 50 percent dependency ratio in most developed countries. The financial implications of this growing welfare burden are dramatic. According to another BIS study, even in a benign scenario in which current deficits were reduced to precrisis levels and age-related spending was frozen at current levels of GDP, public debt would continue growing at a significant rate. Only Germany and Italy would be able to stabilize their debt levels in such a scenario. (See Exhibit 2.) Nor are states and local governments immune. In the U.S., for example, one estimate puts the unfunded liabilities for city and state employees in the neighborhood of $3 trillion to $4 trillion. Private companies that provide fixed-benefit pensions are also confronting significant underfunding of their pension promises. In 2011, the S&P 500 companies had combined unfunded liabilities of more than $500 billion; liabilities of the European Stoxx 600 were more than €300 billion. For some companies, unfunded liabilities are equivalent to more than 50 percent of their market capitalization. 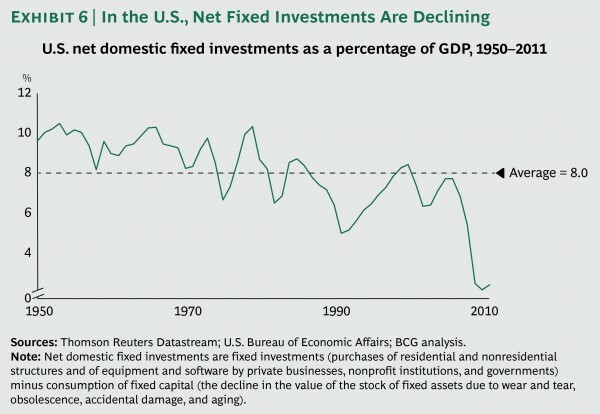 In the current environment, it is highly unlikely that larger investment returns will automatically solve the problem. Such companies will have to fund the gap out of current cash flow, cut their liabilities by offering diminished lump-sum buyouts (as GM and Ford have recently done)—or partially renege on their promises, as the public sector will inevitably do. Meanwhile, private households have relied too long on rising home-asset prices and the promises of politicians and corporate managers instead of putting aside dedicated funds for retirement. In some countries, private households need to deleverage precisely at a time when they should be building up assets for the future. What’s more, the aggressive monetary policies of the leading central banks, designed to stimulate economic growth, have had the perverse side effect of reducing interest income and expected future returns as asset values become inflated, forcing households to increase their savings even more. Addressing these challenges at any time would be difficult. To make matters even worse, however, they come at a moment when the developed world’s traditional model of economic growth appears to be broken. This is partly a consequence of the Ponzi scheme itself. Economic growth is negatively affected by high levels of debt. In this respect, the tendency of the developed economies to fund today’s living with future income has not only created the global Ponzi scheme—it has also severely undermined the ability to resolve it. But the broken growth model is also due to long-term demographic trends and other changes. Oversized Public Sectors. The government’s share in the economy, measured by government spending as a share of GDP, has a negative impact on economic growth as well. A recent study found that an increase in government size of 10 percentage points is associated with a lower growth rate of between 0.5 percent and 1 percent. In most European countries, government spending is currently about 40 percent of GDP or more, and in some countries, such as France and Denmark, it accounts for nearly 60 percent. (See Exhibit 3.) 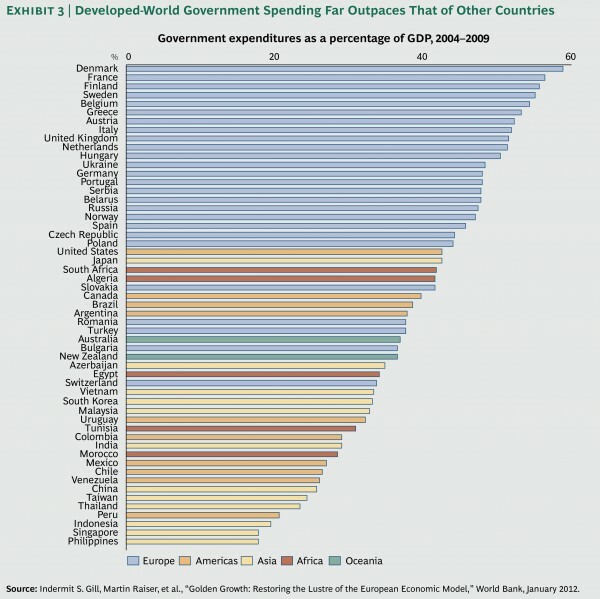 Even in the U.S., government spending’s share of GDP is 40 percent. By contrast, the share of government spending in developing countries is between 20 and 40 percent. Oversized public sectors create an additional drag on future growth, amplifying the impact of too much debt. A Shrinking Workforce. A critical problem in the decades to come will be labor scarcity. This may seem strange given that many advanced economies are currently suffering from high unemployment. But according to projections by the United Nations, between 2012 and 2050, the working-age population between the ages of 15 and 64 in Western Europe will shrink by about 13 percent (to 15.8 million people). In Japan, it will drop by 30 percent (to 23.8 million people). The U.S. working-age population will grow slightly, at 0.4 percent per year, but that is slower than the annual growth rate of 1.1 percent over the past 20 years. The fewer people in the workforce, the less GDP generated and, therefore, the less income available to pay down existing debt. Diminishing Returns from Innovation. Of the factors Gordon cites for this phenomenon, the most important is diminishing returns from innovation. In the 1920s, the Russian economist Nikolai Kondratiev identified a pattern of economic growth consisting of successive “long waves” of economic development, in which periods of rapid growth were interspersed with periods of slower growth and financial crisis before a new cycle of growth began. Later, the Austrian economist Joseph Schumpeter showed how these long waves were associated with major advances in basic innovation—for example, the steam engine, electricity, and the automobile. Of course, Gordon’s view may underestimate the creative power of entrepreneurship to identify and bring to market productivity-enhancing innovations, as The Economist has recently argued. Nevertheless, his view needs to be taken seriously. Innovation may continue to have a positive impact on GDP and living standards, but the marginal effect may very well be less significant in the future than it was in the past. Deteriorating Education Systems. The deteriorating quality of education in most advanced countries also undermines future growth potential. Today, China produces more scientists every year than the U.S.—approximately 310,000 in 2010 compared with 255,000 in the U.S.—and about ten times the number of engineers (2.2 million). And the number of educated people is just one side of the coin. Asian countries regularly surpass developed nations in educational results. In 2009, when Chinese students (from Shanghai) were included for the first time in the OECD’s triannual PISA (Programme for International Student Assessment) tests, they immediately ranked first. Increasing differences in education within the countries of the developed world are an additional burden. In the U.S., the “achievement gap”—the performance difference between African Americans and Hispanics, on the one hand, and white and Asian Americans, on the other—has widened, leading to overall poorer results as the first two groups’ share of the population grows. The same holds true for most countries in Europe, where the descendants of immigrants from Turkey, Africa, and the Arab world tend to perform less well than nonimmigrants or the descendants of immigrants from other regions. Unless these performance differences are addressed, it will be increasingly difficult for members of the next generation to compete with the rest of the world and with each other—let alone pay for the retirement of the current generation of baby boomers. Systemic Underinvestment in the Asset Base. Any global traveler will have experienced how much progress the developing world has made in its investment in public and private infrastructure. At the same time, the public and private sectors in the developed world have underinvested in capital stock. This will have a negative impact as well, because capital investment is a key determinant of future productivity and income generation. The End of Cheap Resources. Ever since the 1972 publication of The Limits to Growth by the Club of Rome, there has been an ongoing debate about how long the easy (and relatively economical) availability of the world’s natural resources will last. Some observers are confident that long-term declines in the price of raw materials (real prices have fallen by half since the 1860s) will continue, citing the fact that new raw-material deposits have been regularly found or substitutes identified. Others, however, argue that the period of declining prices has come to an end. On balance, it makes sense to assume structurally higher raw-material prices, notwithstanding constant and high volatility in the economic cycle. The speed of economic development in the emerging markets and the sheer number of people aspiring to a developed-world lifestyle support this view. Efforts to reduce energy consumption and carbon-dioxide emissions in order to protect the environment will lead to higher costs as well. And if the scenarios predicted by researchers are correct, the costs of dealing with the implications of climate change will only increase in the coming decades. In conclusion, the availability of cheap natural resources, which for more than a century has been an enabler of productivity improvement, may be ending. Higher costs will lead to more global disputes over resources and fewer financial resources to pay down debt. Intensifying International Competition and Rising Inequality. Globalization has brought the promise of economic prosperity to billions of people around the world. But it has also contributed to tougher international competition and the creation of new inequalities of wealth and income in the developed world. The growth in the global labor force continues to put pressure on labor costs in developed economies. At the same time, globalization is leading to increasing inequalities in income and wealth within countries, as some groups (such as investors) benefit more from increased globalization than others (such as manufacturing workers). Income statistics highlight this development: between 1979 and 2007, the income of the average U.S. household grew by 62 percent. Over the same period, the income of the top 1 percent of households grew by an extraordinary 275 percent and the income of the rest of the top 20 percent grew by a slightly above-average 65 percent, while the income of the remaining U.S. households grew by less than 40 percent. The incomes of the lowest quintile grew by only 18 percent. Paralyzing Uncertainty: The Costs of Not Acting. No one knows how long the developed world’s Ponzi scheme can go on without causing major social and economic breakdowns. As long as it does, however, economic uncertainty will remain high. One indicator of growing uncertainty is an index developed by economists Scott Baker and Nicholas Bloom, of Stanford University, and Steven Davis, of the University of Chicago. (See Exhibit 7.) Their “economic policy uncertainty index” shows not only that overall levels of uncertainty have risen since the financial crisis, but also that this uncertainty is increasingly driven by political disputes over economic issues rather than by events such as 9/11, for example, or military conflicts such as the First Gulf War. To the degree that politicians and other leaders fail to address the structural challenges described in this paper, the odds of economic paralysis go up. The underlying issues cannot be ignored any longer. The developed world faces a day of reckoning. It is time to act. There are ten steps that developed economies must take to definitively end the era of Ponzi finance. Some are sacrifices required of various stakeholders. Others are new social investments, both public and private, that are needed in order to return to a sustainable growth path. Although there are tensions and tradeoffs among these steps, they are all necessary to put the developed economies on a more positive economic footing. 1. Deal with the debt overhang—immediately. A precondition to addressing the fallout of the unsustainable policies of recent decades is a fast cleanup of the debt overhang. In previous papers, my colleagues and I have discussed the various options for doing so.35 Put simply, some combination of writeoffs and restructuring, austerity, higher taxes, and sizable inflation will be necessary. The critical starting point is to accept the fact that many of today’s debts will never be repaid and to embrace debt restructuring and defaults. Current policies, designed to avoid that outcome, only postpone the ultimate resolution of the crisis and will result in even bigger losses down the road. Better to move quickly and act now, despite the likelihood of considerable near-term pain. All stakeholders will have to contribute to the necessary cleanup. Creditors and holders of financial assets will have to accept losses. Taxpayers will have to accept higher taxes—with a special burden on the wealthy, because unless politicians begin to address the unequal distribution of income and wealth, they will not have the credibility to implement other painful measures needed to get the developed world back on track. As difficult as that will be, especially for those who have been prudent and saved for retirement, the sooner the developed economies bite the bullet, the sooner everyone will be able to repair their personal balance sheets before they retire. Otherwise, we risk experiencing a lost decade—or more—in which the fundamental underlying problems are not resolved and the value of current savings continually erodes. 2. Reduce unfunded liabilities. Once debt restructuring is under way and the broader public sees that wealthy owners of financial assets are contributing to the necessary cleanup, it should be easier for politicians to take another painful step: addressing openly and directly the trillions in unfunded liabilities that are weighing down budgets and balance sheets across the developed world. It will require a combination of several measures to bring these unfunded liabilities under control. Reduce social-insurance payments. Even with a higher retirement age, it will be necessary, at least in some developed countries, to also reduce future payouts. Again, the sooner the public has a clear picture of what the changes will be and when, the sooner it can begin to prepare for them. 3. Increase the efficiency of government. Parallel to reductions in government spending on social-welfare benefits, another key to reducing government’s share of GDP and increasing economic growth is to make government itself more efficient. A smaller government sector does not necessarily mean a weaker government. By defining the right “rules of the road” for society and business, governments can set the tone and priorities for development in a more effective as well as a more efficient way. Increase the efficiency of the social-welfare system. The administrative costs of welfare systems is an area ripe for rationalization. One change to consider is replacing traditional means testing, which can very quickly become highly bureaucratic and resource intensive, with a guaranteed minimum income. An idea supported in the past by liberals such as Martin Luther King Jr. and John Kenneth Galbraith, but also by conservatives such as Friedrich Hayek, Richard Nixon, and Milton Friedman, a guaranteed minimum income has the advantage of eliminating most procedures for means testing and freeing up resources traditionally used in the allocation and distribution of money. 4. Prepare for labor scarcity. 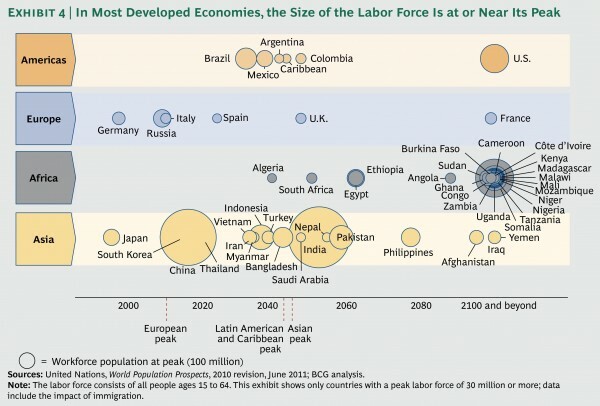 Countries need to start now to prepare for the coming era of labor scarcity. Doing so will require a series of initiatives to reduce the decline of the workforce. Increase workforce participation by the elderly. In general, people will have to work longer, and the elderly will become a key component of the labor force. This change is beginning to happen already, driven primarily by the relative lack of well-educated and employable younger people. In the U.S., for example, the participation rate of workers age 65 years and older has increased significantly, from less than 11 percent of the total population in the mid-1980s to 16.7 percent in 2011.40 Since the depths of the recession in 2009, the majority of jobs created—about 3.5 million out of the total of 4.2 million—have gone to workers older than 55.41 As this trend continues, however, there will be a need for increased investments in training and education, and businesses will have to adapt their processes to the needs of older people. Increase workforce participation by women. Growing participation by women in the labor force has been a major source of economic growth in recent years in the developed world. And yet, in many countries, the share of women in the workforce is still below the high levels reached in Switzerland, Sweden, and Norway, where between 77 and 82 percent of all women work.42 Women should also be encouraged to study economically relevant subjects such as science and engineering. Encourage family formation. Even as women enter the workforce, they should also be encouraged to have more children. Successfully addressing current economic woes will go a long way toward improving the fertility rate (experiences such as Germany’s reunification demonstrate that birth rates are highly sensitive to the social and economic environment).43 Of course, both increasing the participation of women in the workforce and encouraging larger families will require additional social investment in the form of widely available high-quality childcare. 5. Develop smart immigration policy. Even if developed countries take all these steps, it will still not be enough to reverse demographic trends. Therefore, these countries also need to become far more open and attractive to immigrants. With the oldest native population and an immigrant population close to zero, Japan faces the most severe challenge.44 But Germany also struggles to attract well-educated immigrants because of the language barrier. Although immigration to Germany has increased since the financial crisis (up 20 percent in 2011 and an additional 15 percent in the first half of 2012), most of these immigrants are from countries in southern Europe such as Greece, Portugal, and Spain. This internal Eurozone migration only serves to weaken the economies of the periphery further; moreover, whatever economic benefits Germany gains from these new immigrants will likely be canceled out by the higher transfer payments that will be necessary to keep the weak economies in the periphery of the Eurozone from collapsing. From a European perspective, encouraging immigration from outside of Europe has to be the goal. Even the U.S., which has long prided itself on being a nation of immigrants, needs to revise its policies. Since World War II, the U.S. system of higher education has attracted the world’s best students, and the U.S. has benefited economically from their presence. For every 1 percentage point increase in foreign students in the U.S., there has been an increase in patents in the neighborhood of 9 to 18 percent.45 And networks of immigrant entrepreneurs have played a central role in U.S. technological innovation, most notably in Silicon Valley, where more than half of start-ups have been founded or cofounded by Indian or Chinese entrepreneurs. But in the years since 9/11, the U.S. has become far more restrictive, and as emerging markets have gained in attractiveness, a much larger share of foreign students are returning to their countries of origin. According to one survey of foreign graduates, “fewer than 10 percent of Indians and Chinese ‘strongly’ desire to stay in the U.S.”46 In a two-speed world with diverging economic trends, the developed economies will compete against one another and with emerging markets for the same limited talent pool. 6. Invest in education. Education has to play a significant role in the future growth potential of the developed economies. Quality education will be the decisive factor in protecting and increasing GDP per capita. It is also the foundation of social mobility and a precondition to fully utilizing the innovative capabilities and entrepreneurial talent of a society’s members. For both reasons, it needs to be another key target of social investment. Support top students to foster innovation and entrepreneurialism. Even as developed societies improve the average level of education, they also need to be better at identifying and supporting the most gifted students. Innovation and entrepreneurship are heavily skewed toward this small group, so governments must ensure that gifted students maximize their potential.52 The emerging economies are investing heavily in new universities—15 of the top 100 MBA programs in the world are in emerging markets.53 The developed economies need to act fast to remain an attractive destination for top students. Encourage the study of topics relevant to future economic development. Finally, it will be important to direct students toward those subjects that are the most relevant to economic development, notably science and engineering. To some extent this will happen automatically, as students become aware of the attractiveness of the careers for which such studies prepare them. But the shift can be accelerated—for example, by limiting the available slots for less economically relevant subjects or by providing financial incentives for students to choose more economically relevant subjects. 7. Reinvest in the asset base. For more than a decade, the developed economies have reduced investments in public infrastructure and productive assets. Given the importance of the quality of capital stock to productivity and economic growth, it is time to reverse this trend. Increase private-sector investment. Over the past few decades, Western multinationals have used their free cash flow mainly to invest in developing economies. Now that these investments are paying off, it is time for them to reinvest in the efficiency of production sites in their home markets and work off the investment backlog. Governments need to encourage private investment. Tax policies should make it more attractive to invest and less attractive to distribute—for example, by providing tax credits for domestic investment or by raising taxes on dividends. Structural reforms also have to be undertaken to remove labor market impediments to increased investment. 8. Increase raw-material efficiency. The age of cheap resources may have come to an end. Developed countries have to increase their efforts to decouple economic development from resource consumption. Pursue alternative-energy technologies. Although almost half of new power capacity added worldwide in 2011 was in renewables, fossil fuels still contribute around 80 percent to the total power generated.55 And with the discovery of new techniques for exploiting fossil fuels—take, for example, the shale-gas boom, which may turn the U.S. into a net exporter of energy—it will be tempting to slow the transition to renewables. But such solutions will only be temporary. Governments need to accelerate the transition to renewables through investments in national infrastructure and innovative pilot projects. Because of their very long investment horizons, ambitious and highly innovative projects such as Desertec (solar power plants in northern Africa intended to supply energy to Europe) and Masdar (a zero-waste, zero-carbon city for 40,000 citizens in the United Arab Emirates) rely on public funding. Promote “material efficient” production and products. With energy and raw-material prices rising, it is a strategic priority for businesses to continuously improve the production efficiency of their supply chains.56 Furthermore, companies need to invest in material-efficient products in order to satisfy changing consumer demands. Politicians should put in place effective policies so that efficient technologies are developed and applied by companies and consumers. 9. Cooperate on a global basis. Competition among countries will become more intense in the years to come. All countries will try to increase their exports; all will try to attract the best-educated immigrants; and all will try to secure scarce resources, from water to oil to commodities. This increased competition will pay dividends in the form of new and innovative products. But even as they compete, the world’s countries must also cooperate. The problems of the developed economies can only be addressed in a cooperative way on a global scale. Otherwise, the world risks descending into a vicious circle of beggar-thy-neighbor economic policies leading to much lower growth and slower improvement of living conditions worldwide. Support economic restructuring in the developed world. The creditors have to help the debtors pay back their debts. This will require the deficit countries to run a trade surplus and the former surplus countries to run a deficit. The emerging economies need to adjust their business model, focusing less on export-based growth and more on domestic consumption. These countries might also support economic adjustment in the developed economies by participating in efforts to reduce the debt overhang in an orderly way through restructurings and redemption funds. 10. Launch the next Kondratiev wave. Last but not least, the developed world needs to prove Robert Gordon wrong. By investing in a growing and highly productive workforce and making it easier for engineers and technologists to innovate and for entrepreneurs to start new businesses, the developed economies need to unleash a new Kondratiev wave of global economic development. Remove hurdles to innovation. Many government policies in the developed world are designed to protect traditional industries, whether through subsidies or favorable regulation. This practice not only makes the inevitable decline of these industries more expensive to the economy and society as a whole, but also leads to a loss of future technologies and future industries. As hard as it will be to lose income and jobs in traditional sectors, efforts to postpone the inevitable always fail. In the new world, governments have neither the money nor the time to protect traditional industries from change. Removing hurdles to innovation also implies more active antitrust policies, as the high levels of profitability that many industries enjoy today could indicate a lack of competition. Encourage risk taking. Innovation tends to appeal to the young. Some of the most innovative companies—Apple, Google, Facebook, and Microsoft—were all founded by university students in their early twenties. Therefore, it is important for societies to encourage risk taking at a younger age and to make entrepreneurship more attractive and rewarding than working in other functions in the economy. Increase social acceptance of innovation. In many developed countries, especially in Europe, the public has grown skeptical of innovation and new technologies. The classic example is biotechnology and its application in food production and in some parts of health care research. In our view, this resistance to innovation is largely a function of the average age of a country’s population. The higher the average age, the more the population seems inclined to protect the status quo and be wary of the new. Leaders in these societies will have to persuade citizens that only increased innovation can help deal with the costs of demographic change if overall levels of wealth are to be preserved. If neither their debt problems nor their longer-term structural issues are addressed, the developed countries will face a secular crisis, with increasing social unrest and risks to democracy and the free market. Call this the Rome scenario. If the developed world addresses its long-term structural issues but does not solve the immediate debt problem, then that debt will be a permanent drag on economic growth, resulting in reduced GDP per capita. This is the scenario of long-term economic stagnation. 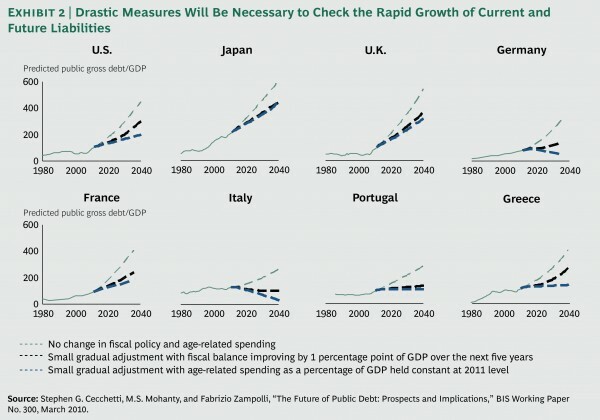 If the developed world is able to eliminate the debt overhang in the near future but does not address its long-term structural issues, it will have missed an important opportunity. The result of this scenario of missed opportunity will be a sluggish recovery, increased social tensions, and reduced GDP per capita. Finally, if the developed world both resolves the debt crisis quickly and undergoes a thorough structural adjustment, it will be able to return to a path of sustainable growth and social stability. Needless to say, the whole purpose of this paper has been to encourage the developed world to embrace this scenario of a return to growth. How can senior executives navigate this uncertain future? The initial reaction—particularly from those who run companies that are active in global markets—might be to acknowledge the facts described here but to see no immediate relevance to their own business and strategy. Some might even say that the current strategy of expanding in emerging markets is sufficient to weather the storm. Although regional diversification has to be part of the answer, it will not be enough. In order to deal with the implications of the necessary adjustments and to benefit from the changes, companies have to do much more. They have an enviable starting position. Despite the ongoing debt crisis in the developed world, companies in the U.S. enjoy record-high levels of profitability, with profits currently representing about 12 percent of GDP.59 Profit margins of European companies have increased since 2008, returning in 2011 to 2005 levels.60 Apart from 2006 and 2007, higher margins have not been recorded since 1981. It is only Spanish, Portuguese, and Greek companies that have been significantly affected by the broader macroeconomic situation. But for how long will companies be in a position to earn such high margins—especially when private households and governments need to deleverage? Either the economic crisis will worsen or governments will increase taxes to deal with their debt problems. High profit levels will not be sustainable unless companies also find ways to contribute to the solution by identifying and investing in new opportunities for profitable growth. Prepare for the new world. Management teams need to develop a point of view by developing a scenario of the coming years of change. Such a scenario should include, among other things, a two-speed economy with low growth in the developed world and higher growth in emerging markets; a greater propensity on the part of consumers to save and, therefore, to consume less; higher taxes; more cautious approaches to financing; and the paradoxical combination of low interest rates and high inflation risk. Only by assessing the implications of such an environment for their organization will executives be able to define the right actions to take. They must review and stress test the corporate balance sheet. Inflation is likely, but a company’s capital structure should also be able to weather a scenario in which severe constraints on financing return and demand falls, causing persistent low or even negative growth. Protect the core. It is most important to protect the company’s current position and competitive strength. The financial crisis is far from resolved, and the issues laid out in this paper will require significant action. Companies must reduce their vulnerability to shocks by reducing costs, creating a solid balance sheet with sufficient financial room to deal with another recession, and accelerating regional diversification to benefit from higher growth in other markets. Be part of the solution. It will not be enough to lower costs and participate in growth in other regions. Companies need to to play an important role in generating and supporting the required growth in the developed world. New Products. Innovation will have to play an important role. The challenges of the future—increasing health-care costs, scarce resources, efforts to protect the environment—all require new answers and new products and services. Companies that contribute to the solution to these problems will be able to generate huge profits; they may even be part of the next industrial revolution. New Business Models. The new world of less growth, less consumption, and older people will require new business models. There will be a need not only for different products but for different solutions to social problems. Companies should find ways to profit from economic and demographic trends. These trends will boost demand in some industries and change the demand structure in others. New Ways of Doing Business. The changes described in this paper will result in new demands from the larger society. Companies should respond to these demands. For example, companies that adapt to the needs of older workers who have had to delay retirement will be helping to overcome the shortage of qualified labor and to increase workforce participation overall. Those companies that adapt first will have a competitive advantage when the shortage of labor becomes more acute. Companies also need to review their performance targets. Sustainability will gain in importance and should be translated into tangible business-specific goals against which the performance of top management is measured. The challenges described in this paper are far too big to be resolved by politicians alone. They require the whole of society to stand together, share the burden, and define the path forward. Company leaders must play an important role in this discussion. But they will have to look beyond their immediate business needs and shareholder interests. As the Ponzi scheme deflates, the only way to achieve a good outcome will be through cooperation. 1. The similarities between Ponzi schemes and the ongoing economic interventions by states and central banks are discussed in “Planet Ponzi: The Danger Debt Poses to the Western World,” Spiegel Online International, January 5, 2012, http://www.spiegel.de/international/world/ponzi-planet-the-danger-debt-poses-to-the-western-world-a-806772.html. See also Mitch Feierstein, Planet Ponzi (Glacier USA, 2012). 2. Stephen G. Cecchetti, Madhusan S. Mohanty, and Fabrizio Zampolli, “The Real Effects of Debt,” Bank for International Settlements (BIS) Working Paper No. 352, September 2011, http://www.bis.org/publ/work352.pdf. 3. Hyman P. Minsky, “The Financial Instability Hypothesis,” in The Elgar Companion to Radical Political Economy, Philip Arestis and Malcolm C. Sawyer, eds. (U.K.: Edward Elgar Publishing, 1994). 4. In 2011, BCG calculated a debt overhang of €6.1 trillion for the Eurozone and €8.2 trillion for the U.S. The new calculation is comparable for the U.S. and 21 percent higher for the Eurozone, reflecting the growth of Eurozone debt since 2011. See Collateral Damage: Back to Mesopotamia? 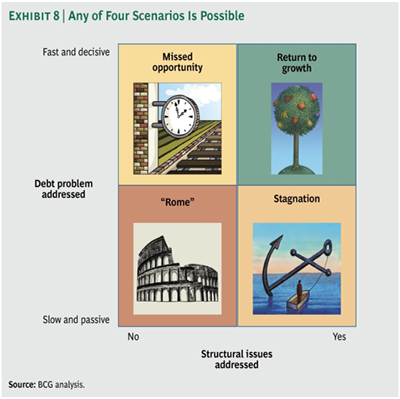 The Looming Threat of Debt Restructuring, BCG Focus, September 2011, https://www.bcgperspectives.com/content/articles/management_two_speed_economy_back_to_mesopotamia. 5. “US Households Are Not ‘Deleveraging’—They Are Simply Defaulting In Bulk,” Zero Hedge, October 15, 2012, http://www.zerohedge.com/news/2012-10-15/us-households-are-not-deleveraing-they-are-simply-defaulting-bulk. 6. For historical fertility rates, see “Children per Women Since 1800 in Gapminder World,” Gapminder, October 1, 2009, http://www.gapminder.org/news/children-per-women-since-1800-in-gapminder-world/. For current fertility rates, see U.S. Central Intelligence Agency, The World Factbook 2012. 7. For population forecasts by age group, see United Nations, World Population Prospects, 2010 revision, June 2011, http://esa.un.org/wpp/Excel-Data/population.htm. 8. Stephen G. Cecchetti, M.S. Mohanty, and Fabrizio Zampolli, “The Future of Public Debt: Prospects and Implications,” Bank for International Settlements (BIS) Working Paper No. 300, March 2010, http://www.bis.org/publ/work300.pdf. 9. Robert Novy-Marx and Joshua D. Rauh, “Public Pension Promises: How Big Are They and What Are They Worth?” The Journal of Finance, July 2011, http://econ.as.nyu.edu/docs/IO/14310/Rauh_20100310.pdf. 10. S&P Capital IQ, “Pension and Other Post-Retirement Benefits,” as reported for fiscal year 2011. 11. “GM Cutting Pension Obligations by $26 Billion on Buyouts,” Bloomberg.com, June 2, 2012, http://www.bloomberg.com/news/2012-06-01/gm-chief-hopes-to-return-to-investment-grade-within-year.html. 12. Carmen M. Reinhart and Kenneth S. Rogoff, “Growth in a Time of Debt,” National Bureau of Economic Research (NBER) Working Paper No. 15639, January 2010, http://www.nber.org/papers/w15639. 14. Andreas Bergh and Magnus Henrekson, “Government Size and Growth: A Survey and Interpretation of the Evidence,” Journal of Economic Surveys, Social Science Research Network, January 2011, http://papers.ssrn.com/sol3/papers.cfm?abstract_id=1734206. 15. Indermit Gill and Martin Raiser, “Golden Growth: Restoring the Lustre of the European Economic Model,” World Bank, January 2012, http://web.worldbank.org/WBSITE/EXTERNAL/COUNTRIES/ECAEXT/0,,contentMDK:23069550~pagePK:146736~piPK:146830~theSitePK:258599,00.html. 16. United Nations, World Population Prospects, 2010 revision, June 2011. 17. Robert J. Gordon, “Is U.S. Economic Growth Over? 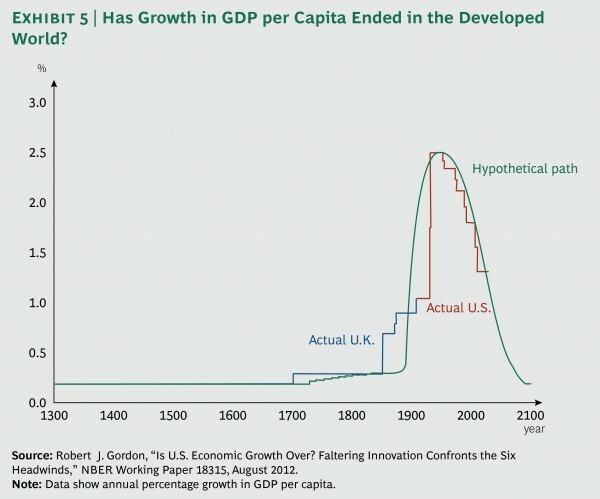 Faltering Innovation Confronts the Six Headwinds,” NBER Working Paper 18315, August 2012, http://www.nber.org/papers/w18315. The paper is also discussed in Marc Faber, “No Rational Thought Will Have a Rational Effect on a Man Who Has No Rational Attitude,” The Monthly Market Commentary Report, November 1, 2012, available at http://www.gloomboomdoom.com. 18. For a more detailed discussion of Kondratiev cycles, see Collateral Damage Part 5: Confronting the New Realities of a World in Crisis, BCG White Paper, March 2009, https://www.bcgperspectives.com/content/articles/management_two_speed_economy_confronting_new_realities_world_in_crisis/. 19. See also Martin Wolf, “Is Unlimited Growth a Thing of the Past?” Financial Times, October 2, 2012, http://www.ft.com/cms/s/0/78e883fa-0bef-11e2-8032-00144feabdc0.html#axzz2E6aqKEiY. 20. “Productivity and Growth: Was That It?” The Economist, September 8, 2012, http://www.economist.com/blogs/freeexchange/2012/09/productivity-and-growth. 21. See European Commission, Eurostat (figures for Europe and the U.S.), http://epp.eurostat.ec.europa.eu/portal/page/portal/eurostat/home/, and National Bureau of Statistics of China, http://www.stats.gov.cn/english/. 22. OECD, “PISA 2009 at a Glance,” 2010, http://www.oecd.org/edu/preschoolandschool/programmeforinternationalstudentassessmentpisa/pisa2009ataglance.htm. 24 In Germany, for example, the overall performance of pupils is directly correlated with the number and origin of immigrants. A larger share of immigrants from Turkey, the Middle East, and Africa tend to be associated with significantly lower ability in reading and math. See Bertold Wigger and Georg-B. Fischer, “Die Zuwanderung macht die Differenz,” Frankfurter Allgemeine Zeitung, October 19, 2012, http://www.faz.net/aktuell/feuilleton/forschung-und-lehre/deutscher-grundschulvergleich-die-zuwanderung-macht-die-differenz-11927910.html. 25. “Corporate Margins Reaching Record Levels,” Financial Times, January 29, 2012, http://www.ft.com/intl/cms/s/0/69373962-48d4-11e1-954a-00144feabdc0.html#axzz2E6aqKEiY. 26. Goldman Sachs, “Spending the Way to Growth, Part 1: Capex,” March 2012. 27. Dylan Grice, “Popular Delusions: Commodities for the Long Run? Not on Your Nellie—I’d Rather Eat Coal! !” Société Générale Global Strategy Alternative View, December 15, 2010. 28. See Jeremy Grantham, “Time To Wake Up: Days of Abundant Resources and Falling Prices Are Over Forever,” Jeremy Grantham’s Quarterly Newsletter, April 2011, available at http://www.energybulletin.net/stories/2011-04-29/time-wake-days-abundant-resources-and-falling-prices-are-over-forever, and “On the Road to Zero Growth,” GMO Quarterly Letter, November 2012, http://www.gmo.com/websitecontent/JG_LetterALL_11-12.pdf. 29. DARA, Climate Vulnerability Monitor: A Guide to the Cold Calculus of a Hot Planet, 2nd ed., Fundación DARA Internacional, 2012, http://daraint.org/climate-vulnerability-monitor/climate-vulnerability-monitor-2012/. The report estimates the carbon economy and climate-related net losses for 2010 at 1.6 percent of global GDP and forecasts an increase to 3.2 percent by 2030. See also Thomas C. Peterson, Peter A. Stott, and Stephanie Herring, “Explaining Extreme Events of 2011 from a Climate Perspective,” Bulletin of the American Meteorological Society, July 2012, http://journals.ametsoc.org/doi/abs/10.1175/BAMS-D-12-00021.1. 30. Martin Wolf, “Romney Would Be a Backward Step,” Financial Times, October 30, 2012, http://www.ft.com/intl/cms/s/0/14054388-1f77-11e2-b273-00144feabdc0.html#axzz2E6aqKEiY. The numbers can be found in U.S. Congressional Budget Office, Trends in the Distribution of Household Income Between 1979 and 2007, October 2007, http://www.cbo.gov/publication/42729. 31. Raghuram Rajan, “Legitimacy Rests on Restoring Opportunity,” Financial Times, October 17, 2012, http://www.ft.com/intl/cms/s/0/c1b96d02-184b-11e2-80e9-00144feabdc0.html. 32. Scott Baker, Nick Bloom, and Steven J. Davis, “Measuring Economic Policy Uncertainty,” Working Paper, June 4, 2012, http://www.aei.org/files/2012/10/02/-measuring-economic-policy-uncertainty_145200643907.pdf. The index is available at http://www.policyuncertainty.com/. 33. The Japanese financial-services group Nomura recently estimated that additional uncertainty, defined as a one-standard-deviation increase in the dispersion of earnings forecasts for companies in the S&P 500 index, is associated with a 4.9 percent fall in fixed investments and a 0.5 percent fall in GDP over one year. See “Economics Must Heed Political Risk,” Financial Times, November 6, 2012, http://www.ft.com/intl/cms/s/0/73e2e428-2804-11e2-afd2-00144feabdc0.html#axzz2E6aqKEiY. 34. For a more general discussion of the ingredients for sustainable economic development and suggested measurement methodology, see Introducing the BCG Sustainable Economic Development Assessment: From Wealth to Well-being, BCG report, November 2012; https://www.bcgperspectives.com/content/articles/public_sector_globalization_from_wealth_to_well_being/. Jan. 9, 2013, 9:18 a.m.
I’d like to take action. Can anyone recommend a group to join towards using collective might to reduce the government debt? How about “FixtheDebt.org” founded by Simpson and Bowles? Opinions, suggestions? Jan. 7, 2013, 11:31 a.m. Thanks to Dan and John for yet another summary and warning of our impending splat against the brick wall with a series of oft repeated suggestions as to how the developed countries can right our respective listing economies and restore sustainable growth. It ain’t going to happen John and Dan. There are too many entrenched interests who have too much to lose and who could care less about the generations to come so long as they can get what’s left for as long as they can. We will do what we have been doing for as long as we can until we can’t. And then we wont. It also seems odd there was minimal to no mention of the population bomb, instead an emphasis on having more babies who can kick in more FICA taxes and compete for jobs that aren’t there now and may not be there in the future. John loves his robots as well, as the model to increasing productivity. That is a real job creator. No mention of global warming and the likely increased costs associated with flooding of the world’s coastal populations. So governments need to rebuild crumbling infrastructure, improve education and shrink in the process while collecting more taxes and reducing waste and corruption all with a political system led by donkeys. There are lots of productive measures we can take as individuals to prepare for this impending collapse but wishin” and hopin” that somehow we can turn this baby around and kickstart our economy back to the way it has been running for the last 100 years is a fools errand. Ponzi Schemes are not fixed and the notion that the world’s financial ponzi can be fixed by 10 suggestions however well thought out and well intentioned is entirely hopeless. The world is past the point of rescue. Since I am a doctor I will use a medical analogy. The world has a metastatic Ponzi carcinoma as lethal as Pancreatic Cancer and some problems like some cancers have no happy solution no matter what measures might be employed. As old George said, “This sucker’s going down!”.At some point I expect John will have to stop flying around the world burning up JP-4 as a waste of his time and ours and get back home to Texas and take care of his family. BTW, Please excuse the double post mistakenly entered under my daughter’s name. I am hugho in Jackson WY. Jan. 7, 2013, 11:15 a.m. The solutions proposed are hardly controversial, although political extremists, i.e. those who deal with the world as they want it and not as it is, will recoil at the renewable energy and higher tax proposals. What is contentious is the extent of the decline of the West that most contributors to ME see as plausible. Increasingly this is a website for a handful of likeminded analysts to huddle together with their arguments cross referencing each other and predicting impending disaster if nothing changes (things don’t stand still). The facts are increasingly irrelevant. For example, take this rather important point from the above “But according to projections by the United Nations, between 2012 and 2050, the working-age population between the ages of 15 and 64 in Western Europe will shrink by about 13 percent (to 15.8 million people). In Japan, it will drop by 30 percent (to 23.8 million people).” Perhaps the word “to” is a typo and should say “by”, but this statement implies that Japan has a working population far larger than the whole of Western Europe, which on most measures is larger than the US. What ME needs is a strong editor and a variety of opinions. We’ve already got Fox News. Jan. 6, 2013, 3:15 p.m. This is a solid analysis but is quite similar to a number of other analyses which all need to undergo a change in approach. This country and world are headed for a train wreck but we have known that for some time. Consider a few points. 1. Without being too cynical it is quite probable that the wreck will not be averted. If so, how does an individual best position himself to survive the wreck. Buying gold and going into long term debt at low rates are obvious starters. 2. All these analyses are from the perspective of a representative American who has the best interests of the entire country at heart. But unfortunately that is not reality. The American left is no different than the left in any other country. They are motivated solely by greed for power and are quite willing to sacrifice the national interests to obtain it. The left has been knowingly pushing illegal immigration for years on this basis. Think about it, if someone was truly interested in the plight of low-income Americans, the first thing they would do is shut down illegal immigration. The left likely believes they would benefit from a financial collapse. Remember the new White House mantra - “Never let a crisis go to waste.” The left is not going to change. 3. Getting the country headed down the right paths will require broad public support which can only be obtained by presenting them with a clear presentation of the facts. Now, we have all seen analyses such as the present one, but they have all been on the internet and similar platforms. This information is never on the national news media. They are part of the American left and intentionally do not present such information. Look at the present conservatives in Congress who are trying to do exactly the right steps to reduce spending, etc. The media continually present them as hard hearted right wing obstructionists who only want to help the “rich.” American universities play a similar role. 4. There is altogether too much talking among ourselves and not facing the reality of how to actually accomplish the necessary steps in the face of a good part of the population who really don’t want to avoid the wreck. Jan. 6, 2013, 9:34 a.m.
My 2 cents: Life comes and goes: individuals, societies, planets, ...you get my drift. Life is a gift and it is up to you what to do with it. Jan. 5, 2013, 7:13 p.m.
All of this article makes sense. But without credible leadership, there’s no way in hell it will come about. So, there’s no way in hell it going to happen. Unless… we have some VERY BIG crisis. This will allow an autocrat to take charge and allow real change to move forward. I’m not necessarily advocating this, I’m just saying that we need leadership, and that there is no sign of that forthcoming, and a crisis is on its way to create conditions favorable to getting real results. I think its too late now to avoid the crisis, so we need to start thinking about what sort of autocrat we want running things, and how we can try to position ourselves for survival. Jan. 5, 2013, 6:12 p.m. I have one practical solution. Every retiree should be allowed pension and other benefits for 10 years. But everyone will be given choice to select their own retirement age. Jan. 5, 2013, 5:01 p.m. If only we were smarter and wiser, we would solve all our problems. Every paper I’ve read deals either with fantasy or addresses the symptoms. The problems are systemic to our government. We are stupid enough to give politicians power to confiscate our money, and to spend even money they don’t have in order to buy votes to get reelected. Jan. 5, 2013, 4:35 p.m.
Having recently read several books on the subject, and being a Mauldin fan and following these discussions, all the astute presentations of the problems and solutions are extremely interesting and intellectually stimulating. Hopefully, these will help me steer my way through the social/economic wreakage (assuming I survive) that is due to arrive very soon. Given well-documented history relating to these kinds of economic problems, with human nature being what it is, I don’t see anyone (or even a group of people) willing and capable of executing/implementing the solutions proposed. Those who understand the problems and correct solutions do not have the political power to impose what is necessary. There are too many opposing forces that will not allow this to happen. We can try to be “opimistic” if we want, but it won’t stop the economic/financial tsunami that is rapidly heading our way. IMHO, we need to brace ourselves the best we can. Jan. 5, 2013, 3:04 p.m. I find myself in far more agreement with the majority of comments already made here than with Daniel’s unrealistic optimism. Most JM readers already know all about the problems (and many of the potential solutions). But alas, the 10 point plan is a non starter—short of genetically modifying human nature on a global basis. By that I mean such a program would have to include for all politicians, bankers and leaders in positions of responsibility to mankind. I don’t believe Daniel’s aspirational plan has a cat’s chance in hell of leaving the starting grid. After the last 2 yrs of witnessing the european farce and more recently Congress’s pathetic performance my confidence level for the survival of this planet is ever decreasing, and it was pretty darned low 5 yrs ago.